A John C. Maxwell book published by Nelson Business 2005, 313 pages, Nonfiction, Business, Leadership and Personal Development, Includes bibliographical references. 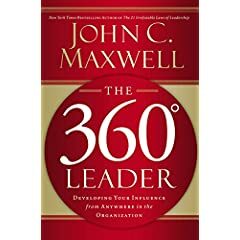 I’m not certain if the motivation for the focus of this book is to unselfishly provide growth insights to those in middle management or a cunning device to target the very people who buy the most books about growth and leadership, but much of Maxwell’s book is devoted to leading from the middle. Who buys the most books about leadership and personal growth? Those who are in middle leadership positions that desire to their job better and possible go further in their chosen field. Who needs the greatest understanding of leadership models and personal development? Those who are in middle management positions that desire to do their job better and possibly to advance. Reality is probably a blend of the two and Maxwell does a good job of providing what both audiences want. A nice handbook on leadership from every direction (leading your subordinates, building you superior, enhancing your peers). Maxwell examines two tenets of leadership which you may find you feel you have conflicting emotions (I know i did). Maxwell believes that those who are deficit in leadership skills tend to hoard their information. They protect their work from peers, supervisors and subordinates in order to make sure they receive their due credit for the work they have done. He also believes that true leaders share everything. They share their best ideas, their hardest work, their most invested projects with everyone from every level in order to provide for the good of all. He feels this type of leader will ultimately reap the benefits of their unselfish and dedicated efforts and, like cream, rise to the top. Here is where I feel torn. I really, really want to embrace this as truth. i want to believe that selfless dedication and talent will ultimately be rewarded. On the other hand, I think of the countless instances in which the work of one of my peers (or myself, for that matter) has been claim jumped by someone else in an organization who rode it to the next level on the pay scale. So, even though I strongly desire to embrace his positive message, I have my reservations. One of the most interesting facets of the book is actually concealed under the back dust cover. If you purchase the book you get access to an online profile of your leadership beliefs and styles. Inside the rear dust jacket is the authorization code to gain you access to a twenty minute survey about your leadership. The difference between this and all the other surveys out there is the option to have a questionnaire to have several other surveys about YOUR leadership skills sent to your supervisor, your peers and your subordinates. They then rate you on the same skills in which you rated yourself. The results are then compiled and submitted to you. This will provide you with the 360 degree snap shot of your leadership. The catch? It costs about a hundred bucks to have the second part of the leadership survey done. But, if you work in a progressive field you may be able to convince your organization that they should cover the expense as an investment in their leadership growth program. At least that’s what I told my boss.